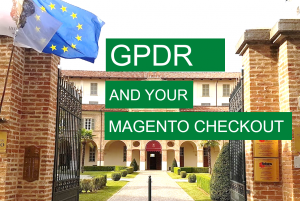 2018 was a very big year for Magento and eCommerce in general especially with the acquisition by Adobe and GDPR. Similarly it was a big year for us as we’ve never attended as many Magento events as in 2018! Let us guide you through the year’s events. ExtDN is the Extension Developer Network which was created when Magento replaced Magento Connect with Marketplace. A clear need to guide merchants appeared, so that merchants can find extensions that are well coded, easy to implement and provide great support. Indeed the number of developers commercializing Magento extension was booming and with that, a growing number of merchants were having frustrating and bad experiences. Read all the backstory here. At OneStepCheckout we feel strongly about providing the best experience to Magento merchants. We have a track record of providing outstanding customer service, solving over 6,000 support issues and going above and beyond what a checkout extension developer would do. That’s why we joined ExtDn. What else could we bring to the table? My marketing experience to help raise awareness of the ExtDN brand and comprehension of their mission and vision though all touch points and targeting everyone in the Magento Community, namely merchants, SIs, solution providers but also Magento Staff. So from January 2018, I was elected to the ExtDN board and naturally chose to lead the Marketing work group. 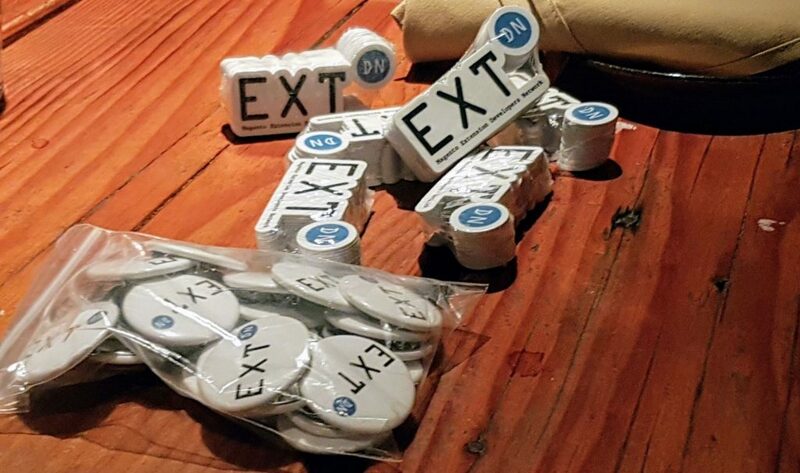 Read all about ExtDN here. The theme in 2018, was ” Lead the Charge”, the keynotes speeches moved to the actual theater of the Wynn Hotel! It was no longer by the Marketplace stalls but a little bit of a walk down. 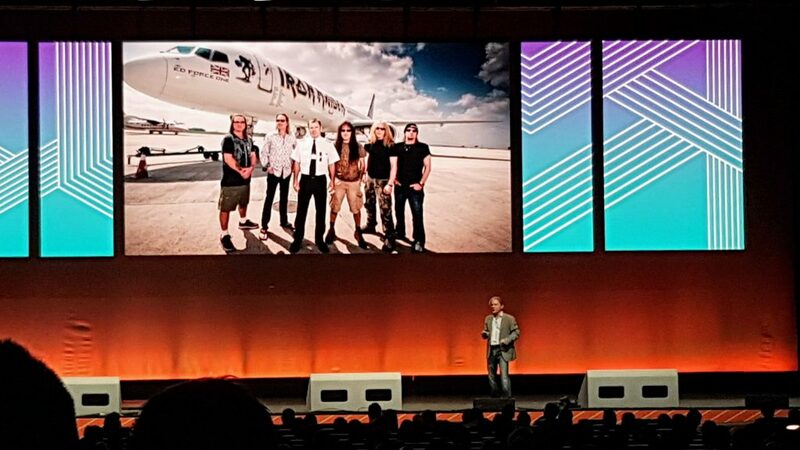 It allowed to seat a growing number of attendees and given the success of the event, Magento also sold tickets that are more cost effective and allow you to view the keynotes on screen as opposed to being in the theater. The celebrity speaker was Jamie Foxx and it was a lot of fun! Feel that energy! Every year we attend Magento Imagine. It is such an extraordinary event that never fails to inspire with shows that are more sophisticated as time goes and with always new people to meet. 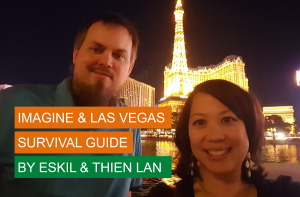 Guide for first timers to survive in that crazy city. What was also a first this time around was the round table about Diversity. Not enough people were aware it was happening but the intention was there and we got good discussions and takeaway points out of the session. 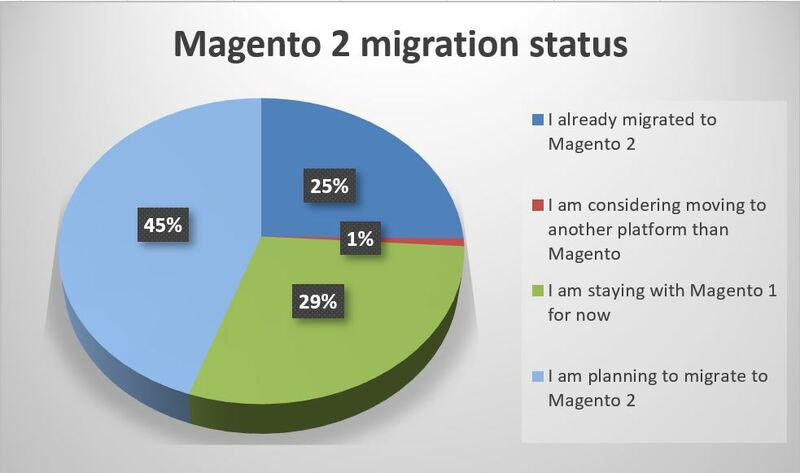 One key highlight of this survey is that we realize that a lot of merchants are still not planning to migrate to Magento 2. In fact we had the feeling it might be the case. We’re on the same boat, with less than 10 SKUs, it’s hard to see the value in upgrading. This customer survey allowed us to confirm our feeling with numbers that we could extrapolate out to the total number of Magento Stores. As such, when we saw that approx 60,000 Magento 1 stores are not planning to migrate to Magento 2 for now, we built a strategy to support merchants on Magento 1 as long as they will need it. This is the official date when the big news is revealed. Read the Press Release here. A big part of the Community is scared because they didn’t like what happened when Magento got bought by eBay Inc back in 2011 or they fear that it’s confirming Magento strategy to move up market and go head to head with the Hybris and Demandware, leaving smaller merchants and extension developers behind. There is also concerns around Adobe’s misalignment with Open Source. But Magento listens and sends down the Adobe Developer Evangelist Matt Asay, to get the information and vibe first hand. In October he will write an article to reassure and show more commitment to keeping and growing Open Source. It’s funny how it’s gone all quiet after the summer. It was THE buzzword in 2018 as it impacted all Magento merchants but also businesses like ourselves. As we deal with Checkout, the place where you collect all the customer’s personal information, it was our duty to do our research and make it easy for our customers to understand the impact of the new regulation and actions to be taken. This was the first big event that happened just after the acquisition announcement, so Mark Lenhard, VP of Strategy and Growth made special plans to come to event to take questions and reassures the community. His key messages were around Business As Usual, not leaving SMBs behind and that the combination of the two companies can only do good to everyone. 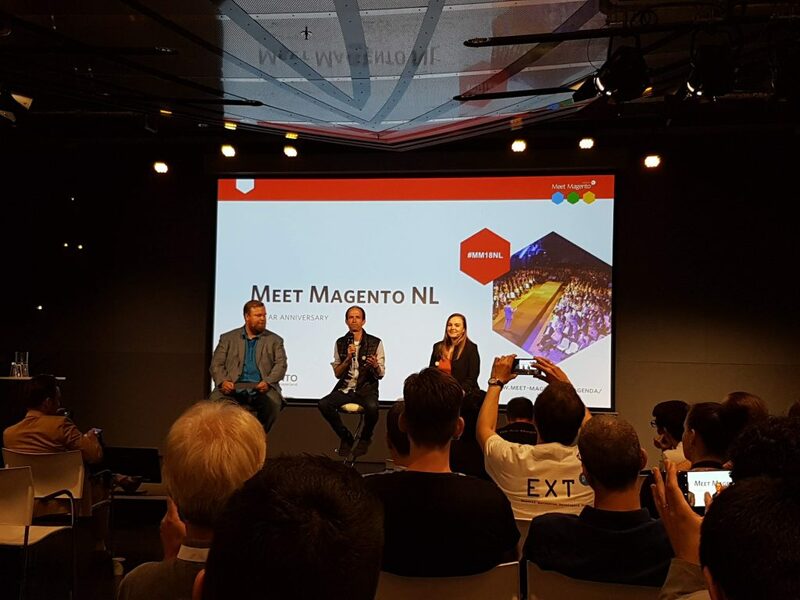 Just behind Imagine, Meet Magento Netherlands is the largest Magento event and the longest standing as the Netherlands have been pioneers with Magento. Although we attended in 2017, we came back to help raise further awareness of ExtDN brand, mission and vision. The German market as it’s the largest economy in Europe and the 4th biggest Magento market in the world. 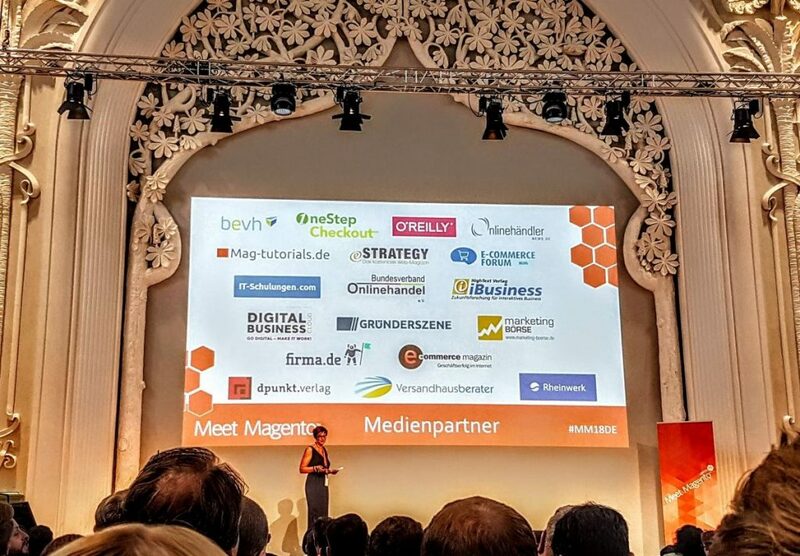 As such it was a priority for us to participate to Meet Magento Germany and we did so as a media sponsor. I also submitted a talk, my second in the Magento Community after the one I did the previous year at Meet Magento Netherlands. 25% Logos i.e. the means of persuasion through logic, data, and statistics. That’s at the end of my talk when I focused about checkout conversion, the reasons for cart abandonment and how to address those. 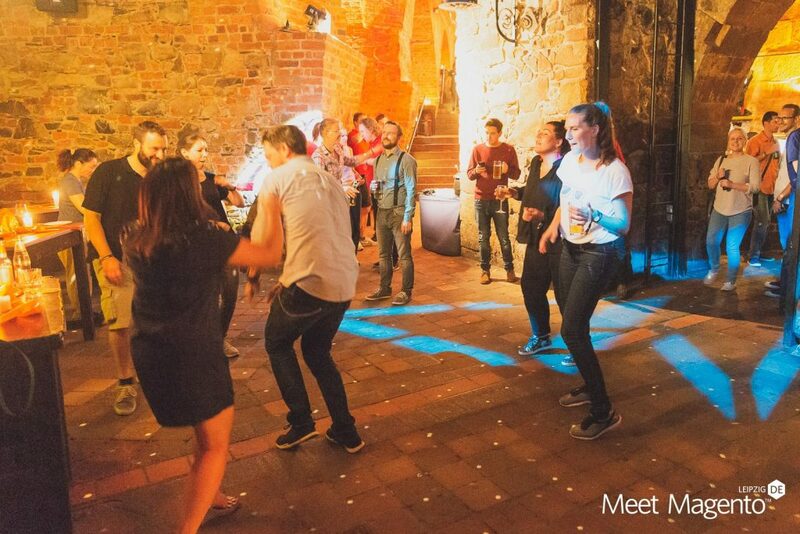 Other highlight of the German event was the party venue and its dance floor which was incredibly fun thanks to Sponsor MaxCluster. Photo credit: Meet Magento Association e.V., Photos by: Büro 71a, Neitzel und Klose GbR. 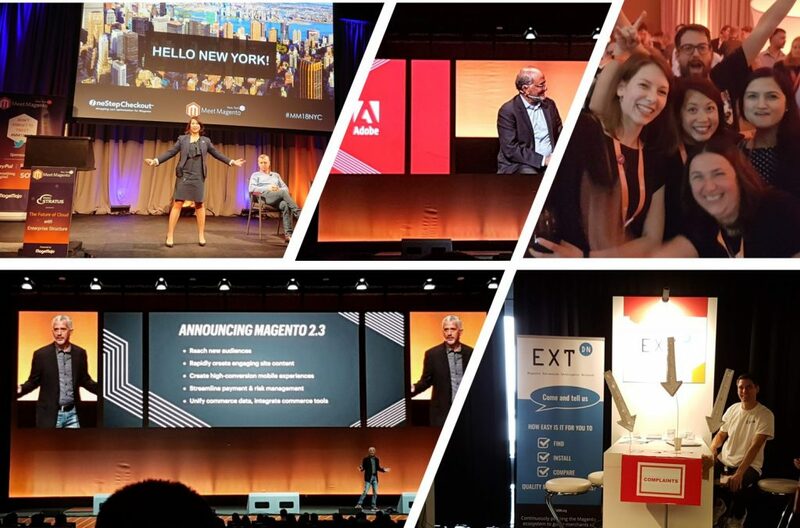 First of its kind, Magento Live Europe was like Imagine going to Europe with close to 2,000 attendees over three days! We were very proud to sponsor the PreMagento Live Party. It was fun and agencies from all over Europe came down. 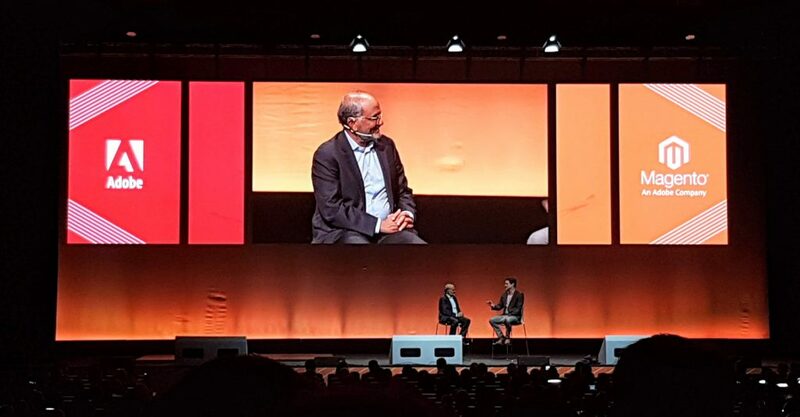 It was also the first major event with Magento being officially part of Adobe and for the first time we saw Shantanu Narayen, CEO of Adobe on stage, talking about what the future looked like for the two companies. The main synergy is around “shoppable experience” with Adobe providing the experience component and Magento powering the commerce aspect. Couple of quotes from Bruce Dickinson, mix of fun and business wisdom. Irreverent but never irrelevant! If it flies, floats or fornicates … Rent it! Remember the fundamentals! It’s people! Taking time off from being an airline pilot to go on tour, how weird is that! At a bar I met a guy who told me he was working for MI6. I was interested because either he had an amazing life or he was the best bullshitter in the world! 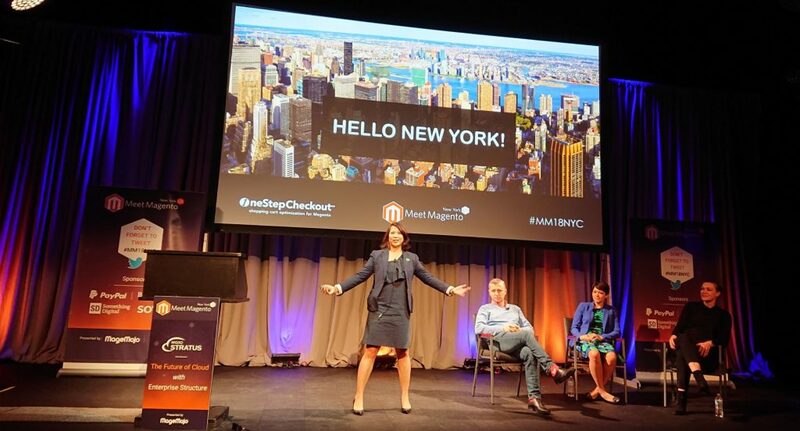 Last but not least of our Magento Event series: Meet Magento New York. It’s the largest Magento event in the US after Imagine and with the US being obviously the #1 Magento Market, it made sense to attend. I also had the opportunity to present another talk that is a little more personal but resonated greatly with the audience. 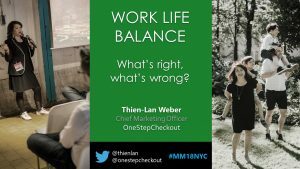 I talked about Work Life Balance and this time had a good 40% of the content on case studies with stats and numbers and also brought in a panel that represented well the Magento Community. Here is the video and the slides of my talk. 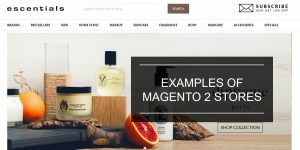 We launched in Q3 2017 and as you know, the Magento 2 platform kept evolving quickly with many third party extensions still not following the coding guidelines. That’s also part of why we joined ExtDN. 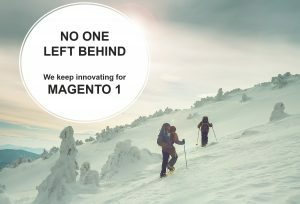 Anyhow, with a lot of persistence and hard work, when most would have given up, our Support team stepped up, kept innovating so that we could improve the checkout experience of most Magento 2 stores around the world, integrating smoothly with their preferred payment and shipping solution providers. For more Magento 2 stores examples you can also follow us on Instagram! 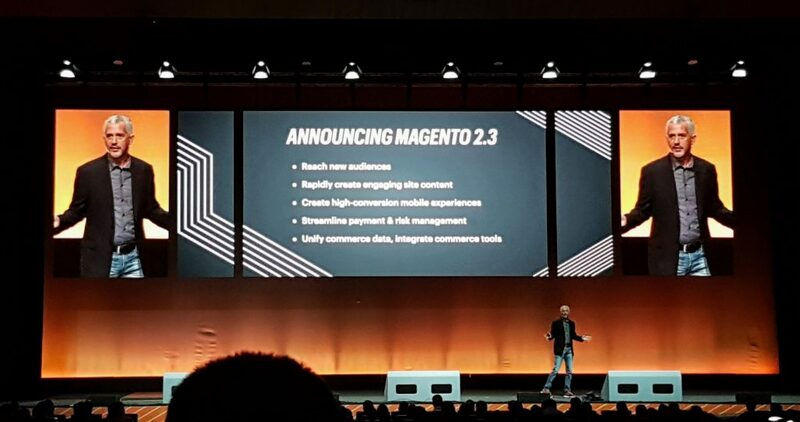 Announced at Magento Live Europe in October 2018, Magento 2.3. released in November 2018. It includes a wealth of new features as well as hundreds of enhancements and fixes to the core product like the core integration with a couple of partners, improved developers experience and most importantly major security enhancements. 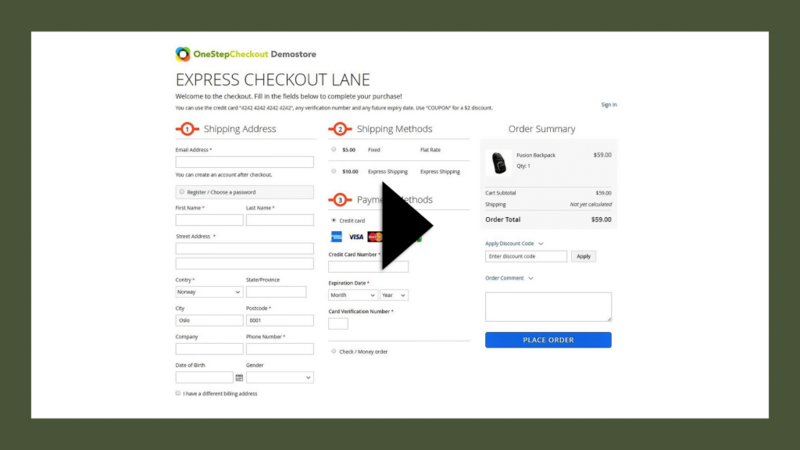 Just over a month later we release our latest version of OneStepCheckout for Magento 2 that is fully compatible with Magento 2.3 so merchants can fully benefit from all those latest improvements and get the best eCommerce platform to boost the performance of their online stores. Who is Oscar? There are a few in the Magento Community but our OSCAR stands for OneStepCheckout Advantage and Reward program. After 8 years it was time to revamp our Partner program. So we revitalized it, added more goodies and benefits to it, including a feature on brand new Partner Page. If you are also a Magento agency who is eager to improve your client’s performance by relying on trusted and rock solid technology that transform checkout into state-of-the art experience, apply here.